Home › The Bible Re-Viewed › What is the Spiritual Significance of the Story of Elijah and Elisha? Can you explain and give the significance 2 Kings 2:1–18 in the life of a Christian? In that article, we drew out a few of the lessons in that Bible story that are plain for anyone to see. In this second (and final) article in response to Adom’s question, we’ll dig deeper, and look at the spiritual significance of this story for our Christian walk. We’ll draw on the method of Bible interpretation offered by Emanuel Swedenborg (1688–1772), and on various commentaries inspired by that method, without actually quoting from them. But mostly, we’ll look more deeply at the text of the story itself, and sleuth out a few of the spiritual insights it contains. To understand the deeper meaning of this story, we need to know its background in the Bible narrative. By the time of Elijah’s and Elisha’s prophetic careers, the glory days of the nation of Israel were already behind it. King David’s spectacular military conquests, which enlarged the borders of the nation to its widest extent, were now a matter of history. His son Solomon’s lavish reign was also a distant memory. In fact, it was Solomon’s lavish reign that led to the breakup and decline of the nation. You can read all about it in 1 Kings 10–12. Solomon built up a vast and very expensive royal court, including “seven hundred wives of royal birth and three hundred concubines” (1 Kings 11:3). Supporting this lavish court put a heavy financial burden on the people. After Solomon’s death, when his son Rehoboam foolishly refused to lighten that burden, but vowed to make it even heavier, the northern part of the kingdom rebelled, seceded, and set up its own separate kingdom. This was the beginning of the period of the “divided kingdom,” in which Judah and a few other southern tribes remained loyal to David’s dynasty, forming the kingdom of Judah, while all of the northern tribes became the separate kingdom of Israel. The northern kings recognized that if their subjects continued to go to the Temple in Jerusalem to offer their sacrifices, their rule would be threatened. So they set up two golden calves as idols in the southern and northern part of their kingdom, and commanded their people to offer their sacrifices at these shrines instead of at the Temple. The Bible narrative therefore considers all of these northern kings to be evil kings. And rather than establishing a stable dynasty as the southern kingdom of Judah had done, these northern kings were often deposed in bloody coups. Elisha’s long career also began during Ahab’s reign, and extended for over fifty years through the reigns of five of Ahab’s successors to the throne of Israel. These were decades of gradual decline in glory and power for the divided kingdoms of Judah and Israel. Little by little enemies rose up and stripped them of their land, money, and power. Ultimately, the northern kingdom of Israel came to its end a little over a century after Elisha’s death, when Assyria conquered it and deported all of its wealthy and educated elite. The southern kingdom of Judah lasted over a century longer, eventually being conquered by Babylon and ceasing to exist as an independent nation. To understand the spiritual meaning of the story of Elisha succeeding Elijah as the leading prophet in the land, it is necessary to understand that this was a time of increasing apostasy and decline, ultimately leading to the end of both kingdoms of Israel. Fifty men from the company of the prophets went and stood at a distance, facing the place where Elijah and Elisha had stopped at the Jordan. Elijah took his cloak, rolled it up and struck the water with it. The water divided to the right and to the left, and the two of them crossed over on dry ground. Elisha then picked up Elijah’s cloak that had fallen from him and went back and stood on the bank of the Jordan. He took the cloak that had fallen from Elijah and struck the water with it. “Where now is the Lord, the God of Elijah?” he asked. When he struck the water, it divided to the right and to the left, and he crossed over. The story then goes on to recount a few more of the early miracles Elisha performed. Like the downward trajectory of the nation of Israel where Elijah and Elisha had their prophetic careers, this is the story of a literal downward journey. 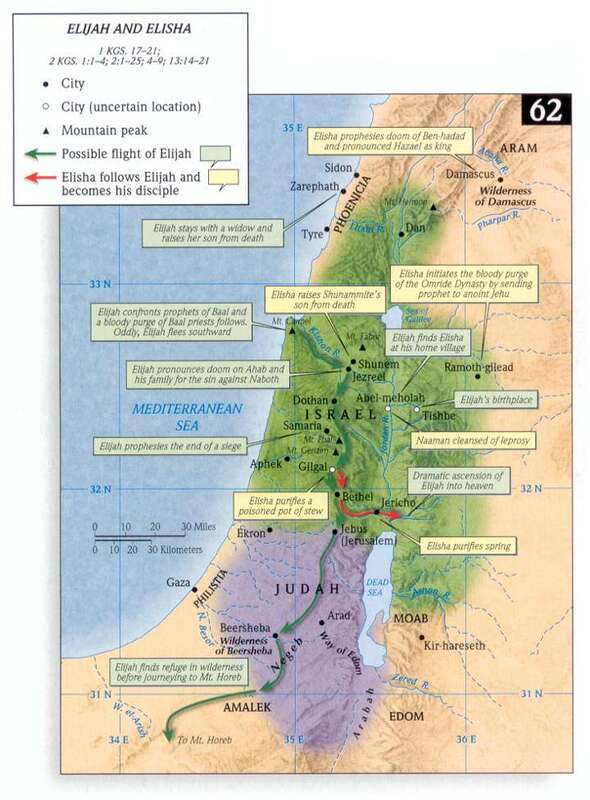 As shown on this map, the Gilgal from which this journey started is not the same as the Gilgal in the story of Joshua’s initial conquest of the Holy Land. (See “What is the Meaning and Significance of Gilgal in the Bible?”) It is another Gilgal located in the highlands above Bethel. Notice that early in the story, when they left Gilgal, it says, “So they went down to Bethel.” Bethel was also situated in the highlands. But Jericho was built in the lowlands of the Jordan River valley. So it was a downward journey from Bethel to Gilgal as well. And of course, the Jordan River was the lowest elevation in that area. Spiritually speaking, then, this is not a story about our ascending up to higher things. Rather, it is a story about a downward spiritual journey—meaning a time when we are losing our sense of closeness to God and spirit, and getting more engrossed in practical and worldly things. We’ll return to that in a moment. Some commentators have mistakenly believed that Elisha’s career was to be greater than Elijah’s because of Elisha’s request to inherit a double portion of Elijah’s spirit—which was granted because Elisha did indeed see Elijah taken from him up to heaven. However, in the context of that culture, what Elisha was really asking of Elijah was to be considered his “firstborn” and primary heir as a prophet. Obviously the eldest son did not inherit twice as much as his father possessed! Rather, he received a percentage of his father’s property that was twice as large as what each of his younger brothers received. In short, the “double portion” of Elijah’s spirit that Elisha inherited meant that he would be the leading prophet and Elijah’s primary spiritual “heir.” And that is precisely how the Bible story treats him. If we read the stories of Elisha’s prophetic career compared to that of Elijah, we find that Elijah focused more on standing up for the God of Israel against popular pagan gods and goddesses. Elijah’s career was dedicated to maintaining the presence of God among the people. It was a lonely life of bucking the political and social trends of his time. Elisha’s career was more focused on dramatic miracles and engagement with the political and social life of the nation. Elisha was a popular and politically connected prophet and a man of the people. Though he was a prophet of God, he focused less on maintaining the worship of the God of Israel, and more on injecting God’s will into the social and political activities of his nation. And that brings us back to the deeper meaning of this story for our lives. When we first start out on our spiritual journey, dedicating our life to God and consciously working on becoming a more spiritual, faithful, and loving person, we may think that from now on our life will follow a continuous upward path. But life is what happens when we’ve made other plans. The reality is that just as the terrain of the Holy Land has both mountains and valleys, so also the terrain we travel on our spiritual path has its ups and downs. And some of our downs go way down. Very often our spiritual life takes a downward plunge when the practicalities of life in the world rear their ugly head. We fall away from our spiritual study and focus because all of our time is taken up just dealing with work, money, food, housing, family and community responsibilities, and so on. This is a deeper meaning of the transition from Elijah, with his focus on maintaining God’s presence in his nation and among his people, to Elisha, whose career was immersed in the practical, political, and social affairs of his people. It was Elijah, not Elisha, who became the representative Old Testament prophet. He is the famous prophet mentioned time after time in the New Testament. In the judgment of history, Elijah remains the greater prophet. And when we are on the downward spiritual path from Gilgal to Jordan, from Elijah’s God-centered career to Elisha’s people-centered career, we may feel a terrible regret that we have fallen from our former spiritual heights to a materialistic low point. And in a sense, we have. And yet, our spiritual journey must also be a practical journey. If learning to love God doesn’t take us into the trenches of practical service to our fellow human beings, what good is it? God did not create us to spend our whole life cloistered away in ethereal contemplation of God and spirit. Our spiritual mountaintop experiences are meant to inspire us to become more willing and able to love and serve our fellow human beings in good and practical ways. There is no need for us to become discouraged when our times of enlightenment and closeness to God give way to times in which life is a whirlwind of work and social activities. After all, it was a whirlwind that carried Elijah up to heaven. And in the whirlwind of our daily tasks and activities, we can also experience the presence of God and spirit working in our life. Just as Elisha was inspired by seeing his master and mentor carried up to heaven in a whirlwind, and went on to do great deeds of help and service to his fellow citizens in the name of the God of Israel, so we can come away from our times of closeness to God newly inspired to serve our neighbor in practical ways. After all, Jesus taught us that as much as we have loved and served our fellow human beings in need, we have loved and served God (see Matthew 25:31–46). There is far more to the spiritual meaning of this story than we can possibly cover in a single article. I hope the few that we have covered here will give you some sense of the spiritual treasures hidden within the story of Elijah and Elisha. And I hope they will give you new inspiration to get up each day and bring God into the world in practical actions of service to your fellow human beings, just as Elisha did for the people of his nation. What is the History and Importance of Bethel in the Bible? ‹ What Can We Learn from the Story of Elijah and Elisha? These past two articles have come at the perfect time as I’m researching the same topic. So thank you! I just wanted to point out what I believe is a typo in the paragraph about Elisha’s prophetic career compared with Elijah’s. I think you wrote “Elijah was a popular and politically connected prophet..” instead of Elisha. Glad these articles were helpful to you! And thanks for pointing out that typo. It is now fixed. Thanks for stopping by, and for your comment and question. However, since I’m not Catholic, I’m not the best person to ask about the proper way to do the sign of the cross. I would suggest asking a priest at your church. Meanwhile, Godspeed on your spiritual journey!